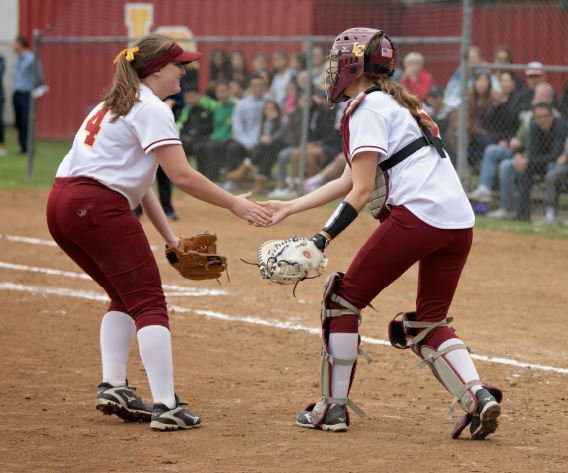 Cox blasted a 1-0 high-rise ball from Maranatha ace Devyn Netz near the scoreboard, sending La Cañada to its first CIF quarterfinal since 2014. The Spartans will travel to West Hills to take on No. 3-seeded Chaminade today at 3:15 p.m.
La Cañada (23-4-1 overall record) slowly broke down Netz, who struck out eight and surrendered five hits in six innings of work. 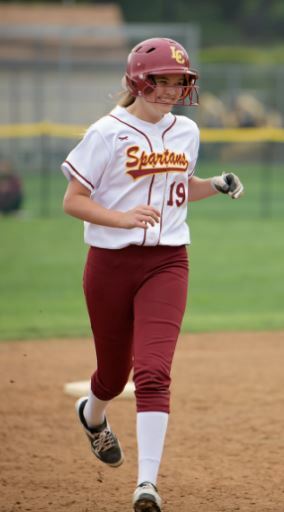 Alexis Abboud, who was 3-for-3, hit a double in the bottom of the sixth inning, but Netz’s teammates broke her out of the jam by doubling up Abboud after a Taryn Harris flyout. Luckily for the Spartans, Maranatha (16-8 overall) had similar struggles with Holly Stoner. The La Cañada ace stood toe-to-toe with her opponent and tossed a two-hit shutout, walked three and struck out six. The victory was especially sweet for Stoner, who will be playing her first quarterfinal game along with seniors Maddy Reilly, Emily Clarkson, Kelly Steele, Abboud and Harris. LC catcher Taryn Harris (right) high-fives Holly Stoner after a strikeout. The La Cañada ace struck out six and will play her first quarterfinal today. The Spartans share one common opponent with Chaminade in Sun Valley Poly. La Cañada fell to the Parrots, 2-1, in a tournament game and the Eagles blanked Poly, 7-0, in April. Gunter said his team is playing with confidence and grit after what happened last season. Stoner echoes her coach when talking about the team’s chemistry.